After pressure from constituents, U.S. Sen. Maria Cantwell held three town-hall in the Seattle area over the past week. She got an earful, particularly about health care, at Saturday’s event in White Center. After her daughter was born prematurely and weighed less than 2 pounds, Keisha Teel said she and her husband would have been buried under hospital debt had the Affordable Care Act not covered some costs of treating her daughter Mackenzie’s health complications. At a town-hall meeting in White Center on Saturday, an emotional Teel urged U.S. Sen. Maria Cantwell to preserve the Affordable Care Act (ACA) in the face of Republican plans to repeal the law also known as Obamacare. Teel was one of several to raise health-care issues in the wide-ranging, two-hour community gathering with Cantwell. It was the third town hall that Cantwell, a Democrat, held this week in the Seattle area after a group of constituents pressed her to do so. She said she would hold town halls in Wenatchee and Spokane next month. “It’s a jump ball and we have to fight,” Cantwell said of the GOP’s prospects of repealing the ACA in the Senate, where Republicans hold the majority. Cantwell said Republicans may vote on repeal soon after the Senate returns from its July Fourth recess. She said she understands that reluctant Republican senators are being courted by the White House in individual meetings aimed at winning crucial votes. Senate Democrats have been united in opposing repeal of the ACA, which would leave 22 million more Americans uninsured in a decade, according to the nonpartisan Congressional Budget Office (CBO). But unless Democrats are joined by at least three GOP senators, the repeal effort would succeed. Jeanne Archie, of Graham, asked Cantwell a question that underscores the deep partisan divide on health-care policy: How do we get to a sustainable bipartisan solution when it feels like collaborating with the other party is a political liability? Cantwell said she has worked with Republicans in the past and would do so again, but her immediate focus was on keeping millions from losing health coverage they gained through the ACA’s expansion of Medicaid to lower-income people. Questions from the audience of several hundred at Evergreen High School touched on topics including internet privacy, renewable energy, the rising cost of living and investigating Russian influence in our elections. The crowd was a mix of young and old, but mostly appeared to lean Democratic based on the most rousing applause during the event, when Julian Gantt of Seattle encouraged Cantwell to support “Medicare for All,” a Democratic proposal to broaden the government-subsidized health-care program that now serves Americans 65 and older. Gantt said his mother had to declare bankruptcy at age 64 after she had a stroke and her bills mounted. Cantwell said she wants to keep her focus for the short term on fighting the ACA repeal. She stopped short of endorsing “Medicare for All,” saying she wanted to preserve options should a more affordable alternative surface. Gantt said he was not satisfied by Cantwell’s response. Neither was Avery Schwartz of Seattle. Schwartz asked Cantwell what she’ll do to quell violence that’s erupted at recent political protests. Cantwell said she and a dozen senators sent a letter to U.S. Attorney General Jeff Sessions urging him to consider violent protesters in a crime-reduction task force he’s created. 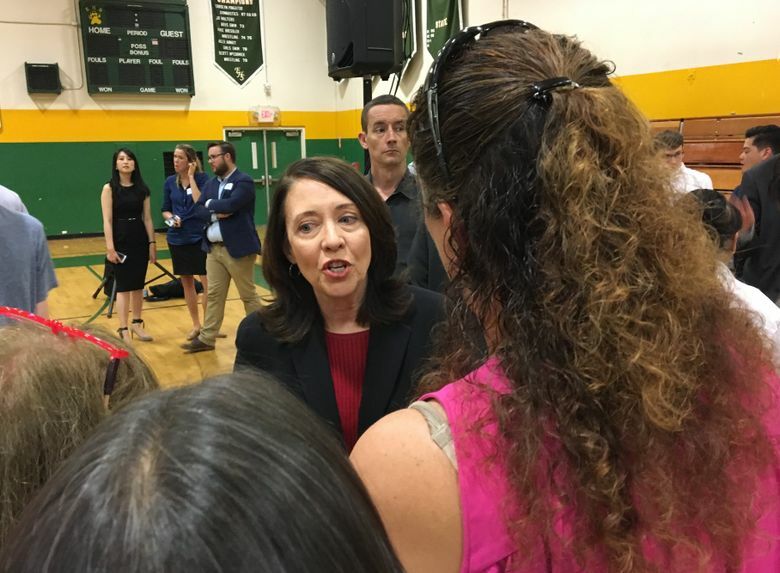 Cantwell’s town-hall meetings come after more than five months of work by the liberal activist group Seattle Indivisible, which opposes the agenda of the Trump administration — and has been pushing lawmakers to stand in total opposition. She held one meeting focused on health-care Wednesday evening at the University of Washington and another Friday on internet neutrality at Town Hall Seattle. Seattle Indivisible has pressed U.S. Sen. Patty Murray as well, without success so far. Town halls have long been a tradition for many members of Congress. In Washington state, Reps. Rick Larsen and Derek Kilmer have held dozens in recent years. In Seattle, Rep. Pramila Jayapal held one on health care Thursday. Nationally, some Republican U.S. House members have dodged the events in recent months. Others have faced hostile constituents angered by Republican health-care proposals that would dismantle parts of the ACA, including a rollback of its Medicaid expansion.